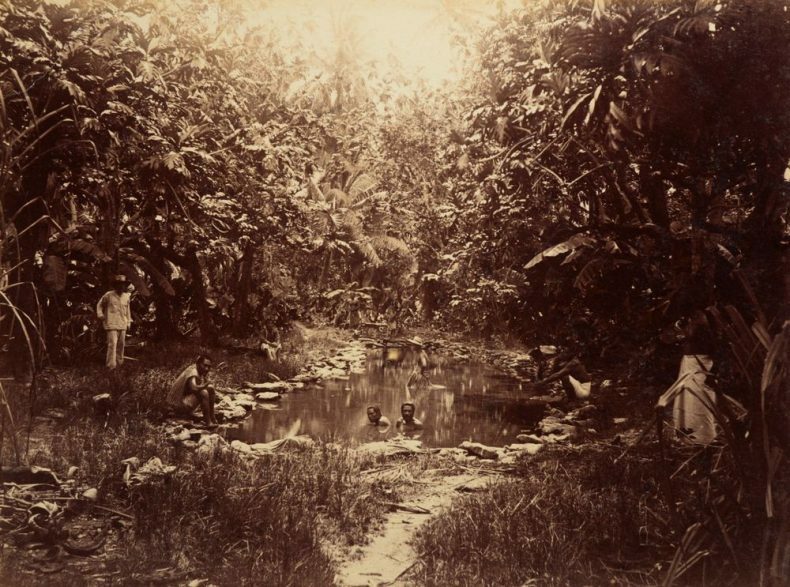 In acknowledgement of of Tuvalu Language Week which ran from Sunday 1 October – Saturday 7 October 2017, Pacific curator Rachel Yates looks at daily life in Tuvalu through five photographs taken by New Zealand photographer Thomas Andrew (1855 – 1939), who spent a significant amount of time in the Pacific region. Whilst on a tour of the Pacific on the schooner Buster (September 1886 – April 1887) Thomas Andrew made stops in the low lying coral atolls of Funafuti and Nui in Tuvalu. The nine islands of the Tuvalu group are: Nanumea, Niutao, Nanumaga, Nui, Vaitupu, Nukufetau, Funafuti, Nukulaelae, and Niulakita. Tuvalu loosely translates in English to mean ‘eight islands standing together’. The smallest Niulakita has only been inhabited since the 1950’s and is currently grouped with Niutao to be counted as one island. This picture was taken in Funafuti, the capital of Tuvalu. 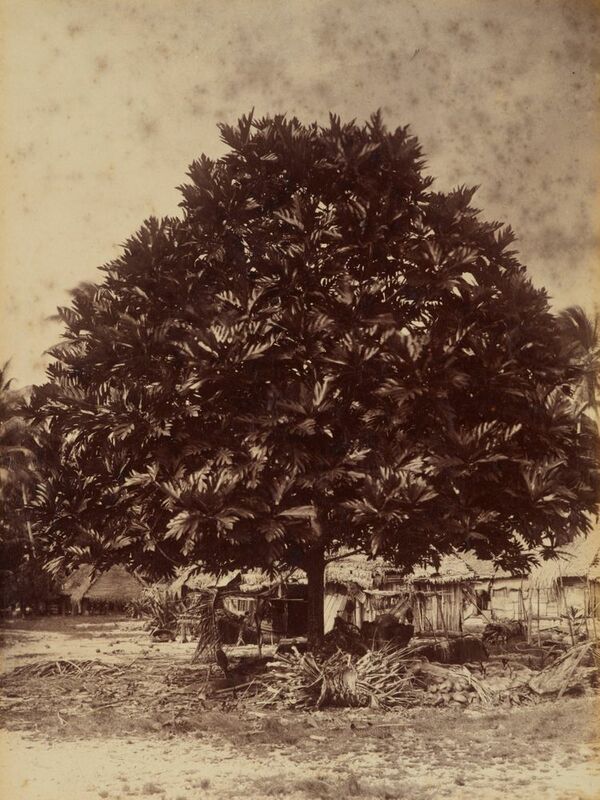 The first settler of Funafuti was said to have been Telematua, a Samoan who arrived by canoe along with his two wives whose names were Futi (meaning banana) and Tupu (meaning holy or abundant). Telematua left Futi on the island and named it Funafuti after her; ‘funa’ is the prefix used for a female. After continuing to sail in search of more land, Telematua reached Vaitupu, where he settled his second wife. He would travel between his two wives and divide his time between the two islands accordingly. When the people of Funafuti would ask Futi why her husband frequently left their atoll, she would reply ‘voai ia Tupu’ (to see Tupu) which over time came to be one word: Vaitupu. The staple foods of Tuvalu include niu (coconut), pulaka (swamp taro), futi (banana), ika (fish) and mei (breadfruit). Mei can be eaten raw or cooked and the tree has a reputation for its high productivity. Ones like that pictured above can yield more than 100 fruit for over 50 years with little care required. Mei as with futi, were introduced to Tuvalu after contact with Europeans. This account possibly references this washing hole shot by Thomas also at Funafiti. There are three men in the pond and a further four on the edges. Access to water is limited across the Tuvalu group and Funafuti no longer has any sustainable groundwater supply. The men pictured bathing in this ‘foul’ water undoubtedly understood the value and scarcity of water on the atoll. They serve here as examples of a population who continue to adapt their lifestyles in response to the increasingly challenging environment they live in. 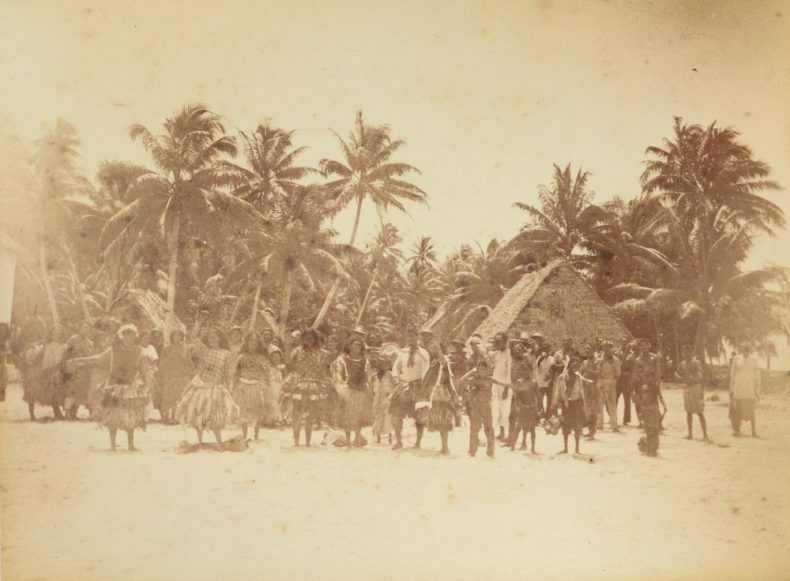 Dance and song were a popular past time in Tuvalu and played a significant role in Tuvaluan society. There were specific dances and styles of singing for commemorations, worshipping and mourning. In more contemporary times, a popular performance is the Fatele. The dance is generally performed on special occasions and differs in style amongst the islands. In this photo you can clearly see items of dress often used in dance. There are fou/fau/mae (head garlands), malele (neck garland) and titi lama (dancing skirts made from pandanus leaves). Nui is recorded as being the first island of Tuvalu to be ‘discovered’ by non-Pacific explorers in the region. In 1568, Alvaro de Mendana a Spanish Explorer sailing from Peru first spotted Nui en route to the Solomon Islands. 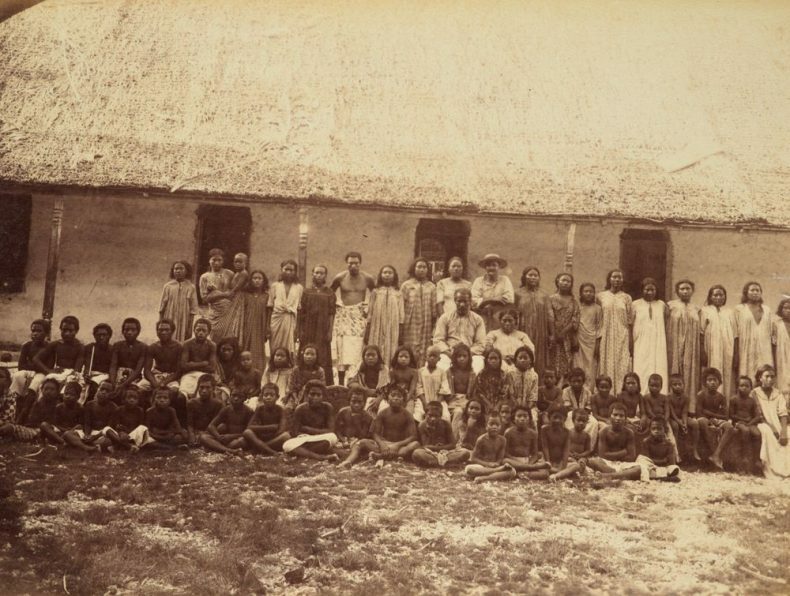 This photo shows a group of adults and children in front of a mission house on the island and references the significant influence of Christianity. By the time Thomas Andrew arrived at Nui, Christianity was already well established. 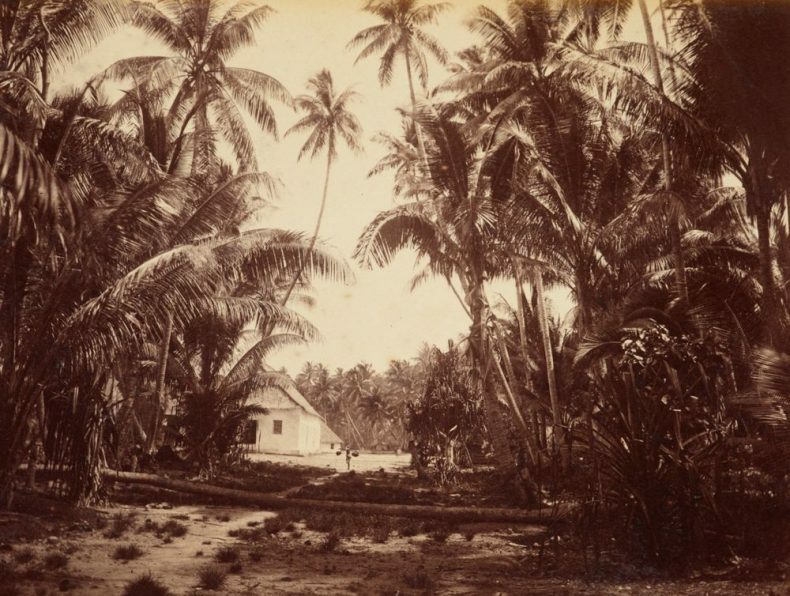 By the end of the 1870s, with assistance from London Mission Society, a Samoan pastor was present on every island of Tuvalu. These pastors were very diligent in their teachings and work in the community. They promptly set about building structures for the Church and introducing laws influencing local way of life. This picture features these introductions including the modest style of dress that became standard in this period. Today, over 95% of the Tuvaluan population are members of Te Ekalesia Kelisiano Tuvalu, The Congregational Christian Church of Tuvalu. Faaniu, S., Ielemia, V., Isako, T., Isala, T., Kofe, L., Lafai, P., Lafita, N., Laupepa, K., Nia, N., Pape, S., Sapoaga, E., Telavi, M., Teo, N.P., Tinilau, V., 1983. Tuvalu: A History. Institute of Pacific Studies and Extension Services, University of the South Pacific and Ministry of Social Services, Suva, Fiji/Funafuti, Tuvalu. Fakafetai Rachel! A welcome insight.